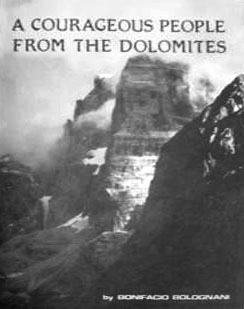 Exert from “A Courageous People from the Dolomites” compiled and written by Father Bonifacio Bolognani, published in 1984. The Genetti motels and supermarkets are well-known throughout Pennsylvania and the nation. Everyone who comes to the Hazleton area encounters Genetti commercials. Raffaele Genetti was the first in his family to settle in the Hazleton area. His brother, Damiano, followed him shortly thereafter. Raffaele settled in Sheppton at first, then moved to the coal mining town of Mahanoy City. When he decided to enter the butchery business, he moved to Weston. His Tyrolean sausages (luganeghe tirolesi) were famous and reached the New York markets. This tradition has been followed by other ethnic groups, including people from Sicily. Raffaele opened the first Genetti Cafe in Weston. The big dancing hall, still remembered by old-timers, drew people from all over to listen to the famous accordion players and to join in dancing. The Raffaele sons, Hisson [webmaster note: I am not familiar with this son and he does not appear in any descendant’s list], Albert and Silvio, did not follow in the father’s footsteps, but were involved in the coal mining. Silvio was controller of the Jeddo-Highland Coal Company for many years and was on its board of trustees until he retired. The great Genetti firm owes its fame to Damiano. He was a captain in the Austrian Army before emigrating. In Hazleton he started a butcher shop in the back of his house, delivering meat door to door for many miles, with a wagon borrowed from his brother, Raffaele. Today his sons, Gus, Albert and Stanley, [webmaster note: Damiano’s oldest son, Leon, had passed away in 1962 before this book was written], together with their families, own a variety of businesses in the area, including a big motel in Hazleton, the Hotel Castelfondo in Wilkes-Barre, a mink ranch, restaurants, a theatre and supermarkets from Scranton to Tamaqua. Recently the Genetti’s Motels had been purchased by the Weston Motel’s chains.